A trail of rose petals is the perfect complement for a romantic get-together and for setting the mood. Scatter the petals in the bed, on the tub or create a path for your partner to follow. Whether at home or away, this gift will transport you and your lover to a place of romantic pleasure. 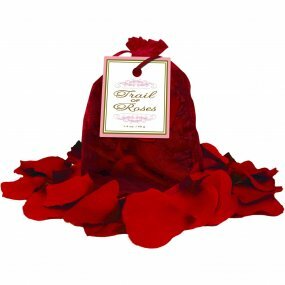 Reusable rose petals to create a bed of roses. Trail of Roses by Kheper Games. Review "Trail of Roses by Kheper Games"